Happy New Year everyone. I figured I’d squeeze in Day 2 of my Zion trip on the last day of 2012. On my second full day in Zion, I got an early start, and hiked up the narrows to shoot a photo that has eluded me for the past two years. Be sure to watch my video journal to hear my thoughts on the final results. 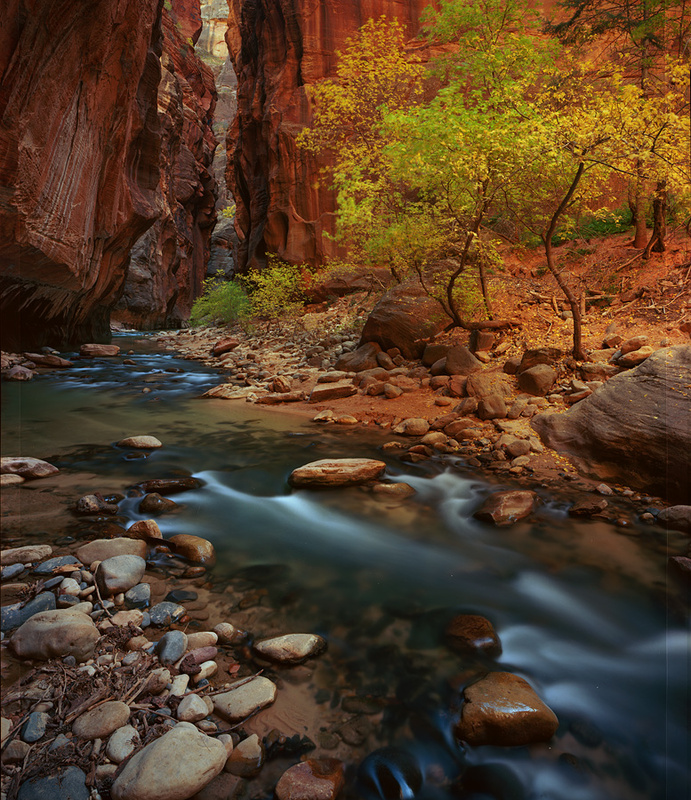 This entry was posted on December 31, 2012 at 4:45 pm and is filed under 8x10, Photo Trips, Photography, Zion November 2012. You can follow any responses to this entry through the RSS 2.0 feed. You can leave a response, or trackback from your own site. Though it might sound crazy to stand there for 4 or 5 hours — the time goes by fast. I often listen to podcasts, and spend time wandering around exploring my surroundings. Ben, I like the shot, even though its not what you intended. I’ve been following your blog for a while now and really enjoy it, you do a great job with every aspect of it. I’ve been taking 4×5 for about a year and a half now so I can understand the appreciation for the beauty and yet a sense of disappointment about not coming away with a shot. I’ve not taken a shot a few times because it just wasn’t there. I love Zion, I got there last fall for a weekend and got a couple of shots. Really wish I could have gotten there this fall but wasn’t able to make it, hopefully next year. I’m looking forward to seeing some of the other shots from your trip. Thanks so much for following my blog! I bought my first 4×5 camera in late 2008, and was hooked. As you’ve found, there’s definitely a different style of working, but its that sense of discipline that I can credit for some of my favorite shots. You inspired me to add video to my blog, but it’s a far cry from your quality productions. I was just playing a wind-waiting game too — but I only needed five seconds. Much easier, but even that isn’t always possible. I will probably never go to large format, but I sure appreciate the inspiration of watching you work at it. Very nice Ben. It is my favorite spot in the narrows. Even though I got an ok shot the year I ran into you there I’ve wanted better. Each year since I have been skunked. The spot has so much potential and can see it in my mind. I do like how yours turned out.